And now, the curtain has fallen. 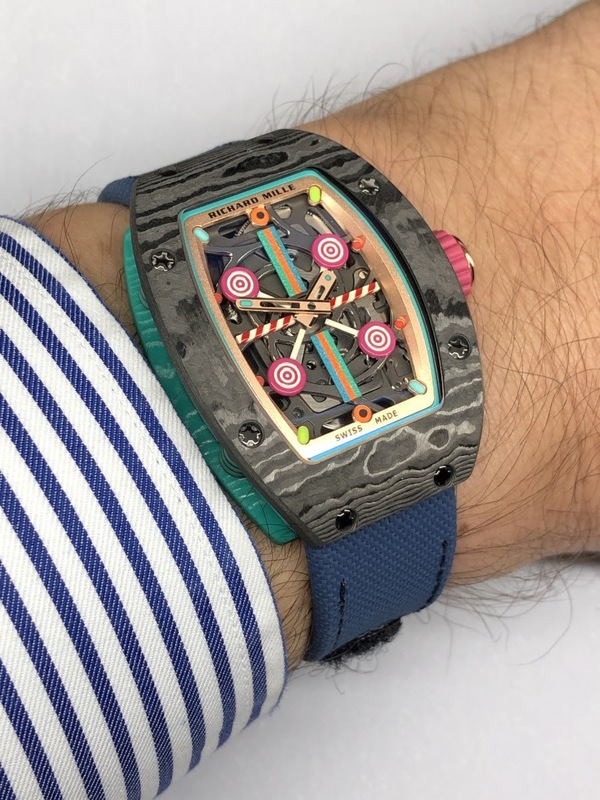 Richard Mille has presented for the last time its novelties in the context of the SIHH (more will come this year obvjously). However, the collection unveiled in Geneva inspires neither sadness nor gloom. 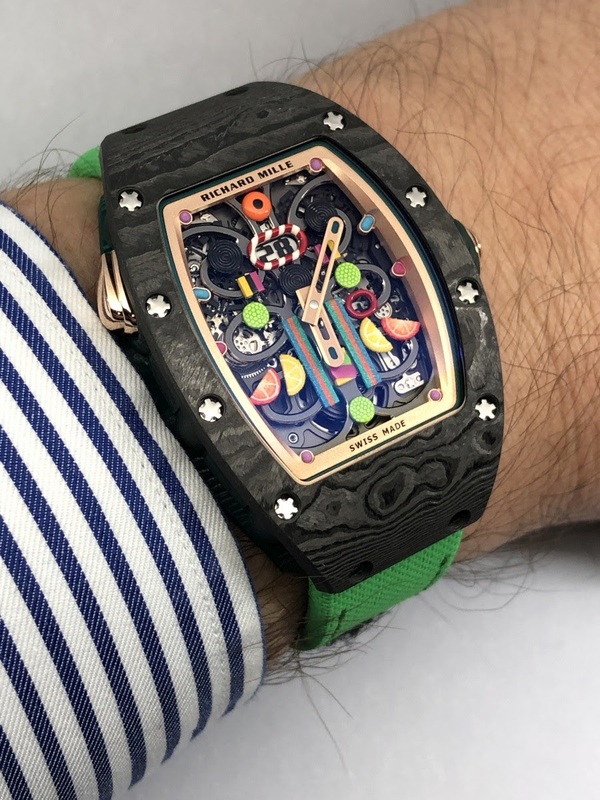 On the contrary, the ten "bonbon" (candy in French) watches bring a breath of freshness and fantasy not only in the Haute Horlogerie segment but also in Richard Mille. In fact, this collection is much more strategic than it looks. It symbolizes the exploration of new themes and therefore a capacity for the brand to renew itself. Admittedly, technical watches, powerful, innovative and which feature specific functions will always be the cornerstone of the catalog. 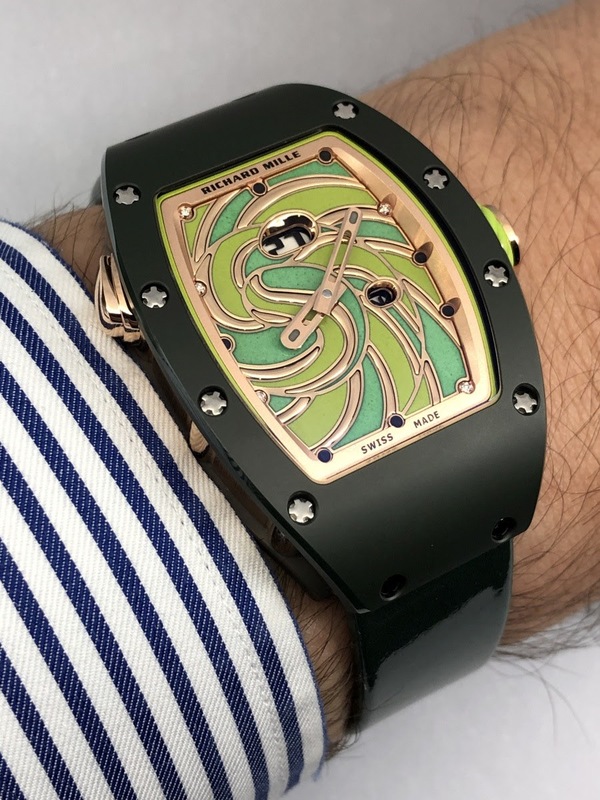 But for some time now, Richard Mille has been addressing women more frequently, as evidenced by the signatures as partners of Nafi Thiam and Yuliya Levchenko or by the release of the RM71-01 Tourbillon Talisman. The goal is simple: it consists in diversifying the clientele base in order to develop growth drivers. And this "bonbon" collection is part of this same diversification process. The "bonbon" collection is not only for women, of course. 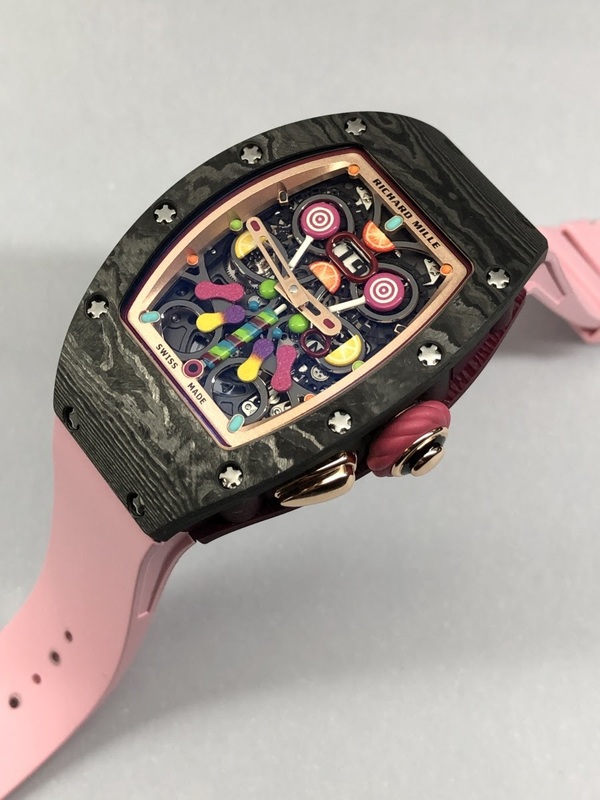 In an intelligent way, Richard Mille doesn't provide any details on the targeted clientele. The collection is decidedly unisex. It will appeal to any type of client seduced first by the theme, the colors, the decorations of the dials. 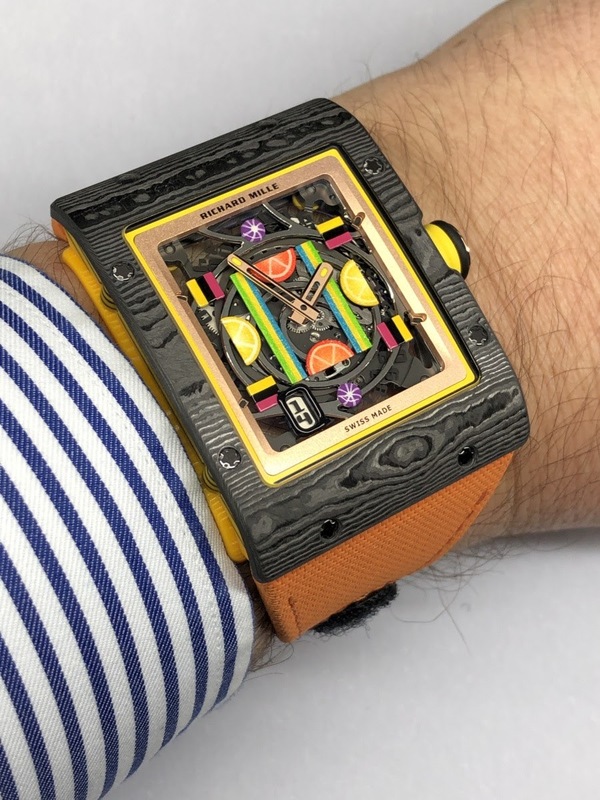 In any case, even if the theme is new, the 10 watches of the "bonbon" collection, released in 30 pieces each, respect the key principles of the brand: they provoke sharp reactions and strong emotions, their quality of execution is irreproachable, they use high-tech materials (such as Quartz TPT, Carbon TPT or Ceramic) and they give the opportunity to propose innovative decorative techniques. 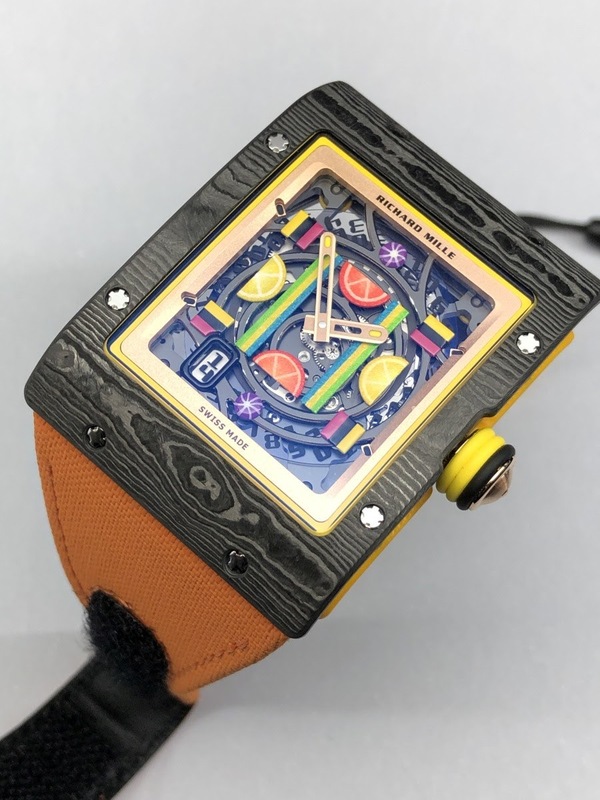 The 10 watches are based on two lines (sweets and fruit) and are based on 3 known models of the catalog: the RM 16-01 (two-hand rectangular watch animated by a Vaucher automatic movement), the RM 07-03 (two-hand watch animated by an automatic in-house movement) and the RM 37-01 (two-hand watch, date and function selector animated by an automatic in-house movement). 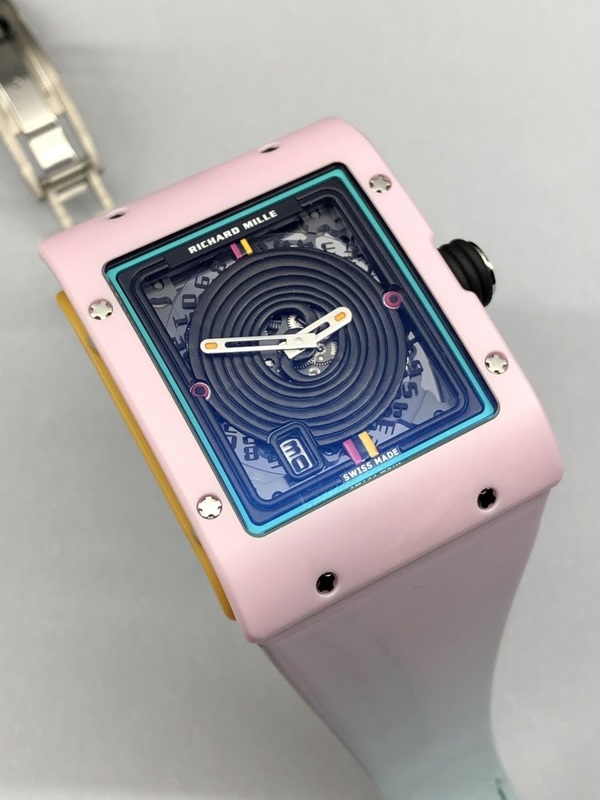 It is very interesting to observe that the artistic director of the collection, Cécile Guenat, managed to completely renew the style of these 3 watches which, in this new context, offer visual renderings different from those to which they have accustomed us. The danger with such a theme was to fall into ridicule or kitsch. But the "bonbon" watches follow the same rules of excellence as a confectioner in his job: everything is a question of ingredients, dosage and know-how. If the sugar is too present, it kills the flavors. If the colors are too aggressive, they cause disgust. 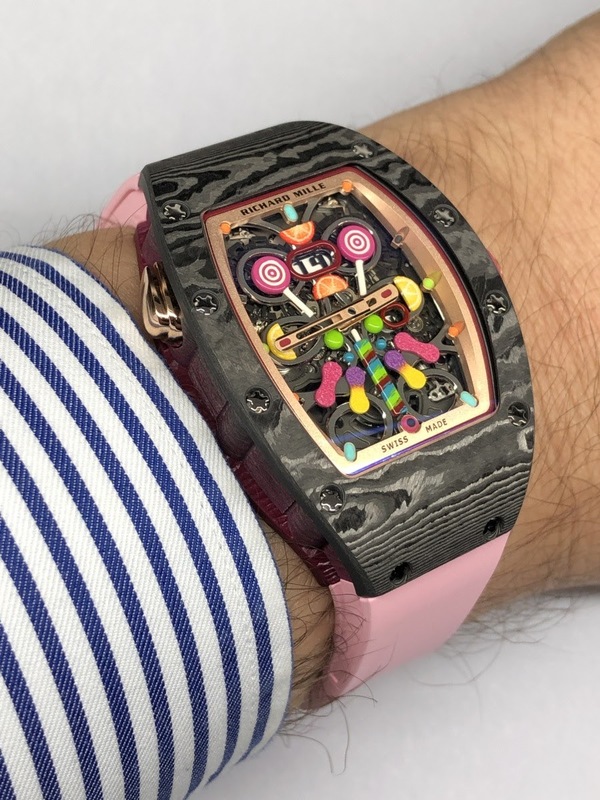 So, for the "bonbon" watches, it was necessary to recreate, using the very latest production and decoration techniques, more than 3,000 small confectionery sculptures that not only decorate the dials but also reinforce the perceived quality thanks to their subtlety. In handling the watches, I had no doubt. The theme is fun, playful even childish. But Richard Mille treated it with a lot of seriousness and control. I took a lot of pleasure to observe the smallest details of these sculptures and especially to appreciate the particular brilliant rendering which transcribed the sweetness of the candies. 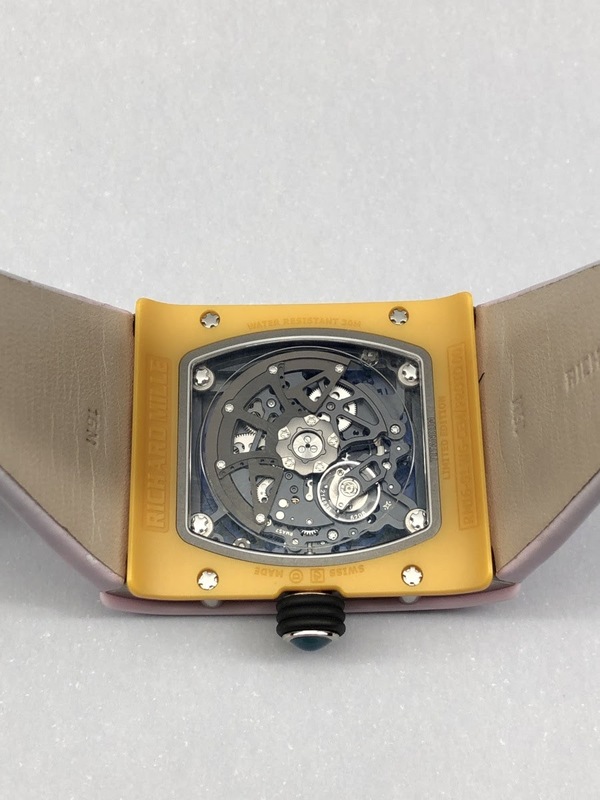 Then the watches are consistent and perfectly chosen. 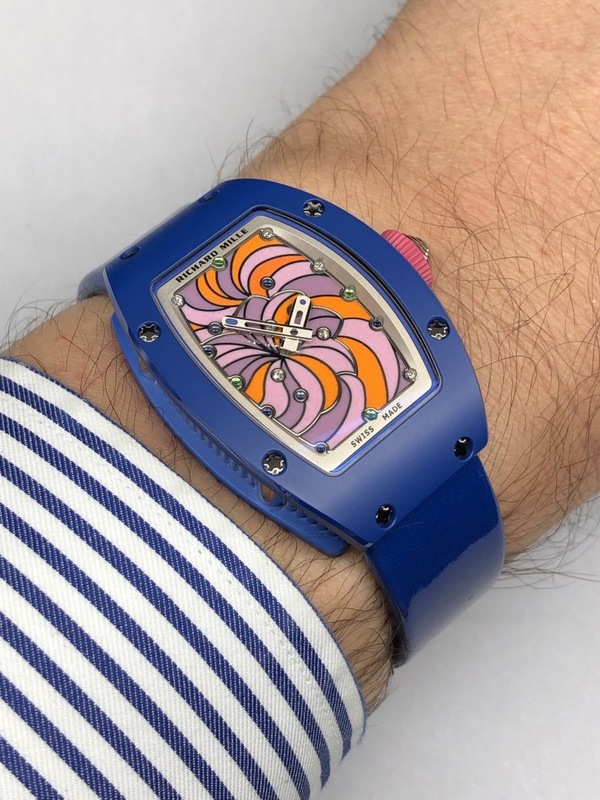 For example, my favorite of the collection is perhaps RM 16-01 Automatic Réglisse because the rectangular case is ideal for highlighting the central spiral. 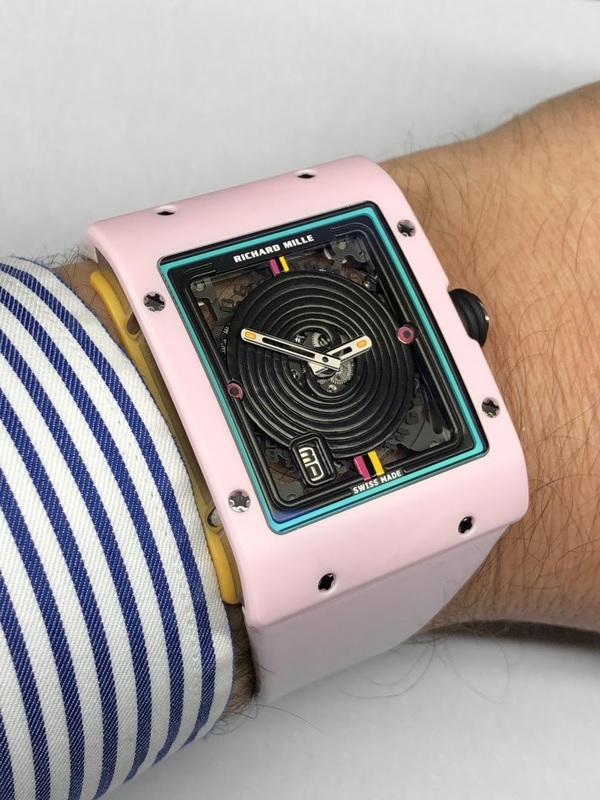 But the RM37-01 Automatic Cerise is also successful because of its much fuller and colorful dial, as if a bunch of candies had spilled on it. And how not to mention the crowns that have been redesigned to adapt their shapes according to the atmosphere of each model? Finally, the colors have been carefully defined. Both lines are aptly named. The "sweets" line explores pastel universes and uses dials decorated by geometric patterns. The "fruit" line offers more energy with dynamic colors. Its dials are more detailed and more spectacular. 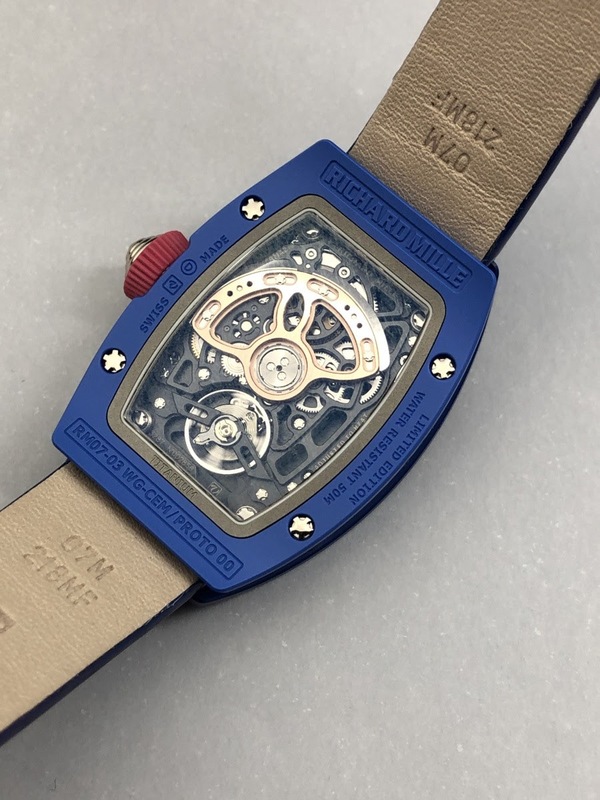 Richard Mille has specifically developed new colors as a turquoise hue of the most beautiful effect. And all these colors (the collection uses 60) complement each other with harmony. This is a bit of the problem of the collection: if you are addicted to this stylistic approach, it will be difficult to stop at a single model... like when you open a packet of candies. But if it's the stomach that tells us to stop in one of the cases, it's the wallet that may slow us down in the other. The "bonbon" collection respects the brand's standards to the very end and that means that the prices are in a logical range of between 127,000 and 164,000 euros. Prices to which it will surely be necessary to add the fees of the dentist. Because the sweets and candies are so successful that we want to bite and crunch them! I offer you a selection of photos taken at the SIHH that highlight the diversity of the collection. To be honest, I didn't necessarily like all models and some are perhaps redundant. For example, I only really appreciated the RM 16-01 Automatic Réglisse in the "sweets" line. But it is not very important. 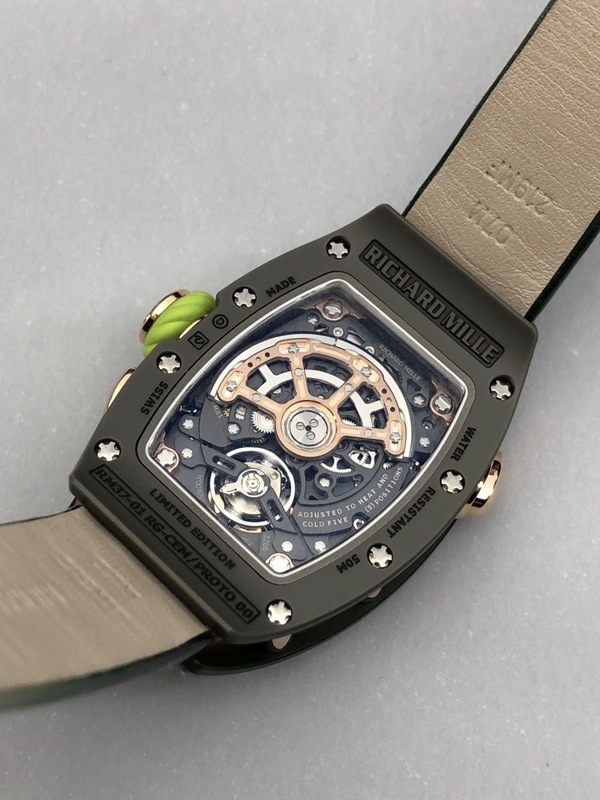 The collection is successful and Richard Mille made an impression and created the buzz at the SIHH. He indicated once again the way to follow to exist at the top of the watch pyramid. We must dare, dare the colors, dare new themes, dare new shapes and especially: dare to have fun. This was maybe the best way for the brand to leave the SIHH: by giving an advice to those who stay! Thanks for your detailed and typically thought-provoking report. I confirm my against-the-mainstream (or so it seems so far) reaction to this collection -- I like it and it does intrigue me! WOW these are some fantastically expensive and UGLY pieces. From RM, the pieces are beautiful but come off a little novelty item to me.